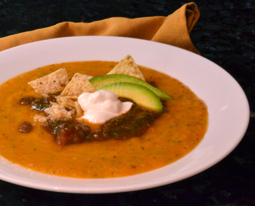 Creamy Vegetable Tortilla Soup - A recipe from Savor California, the online showcase for extraordinary gourmet foods and beverages from California. Cut the onion, carrots, celery and zucchini into small cubes. Sauté in oil until soft. Top each serving with Mrs. A’s Salsa, avocado, a squeeze of fresh lime juice, and tortilla chips.